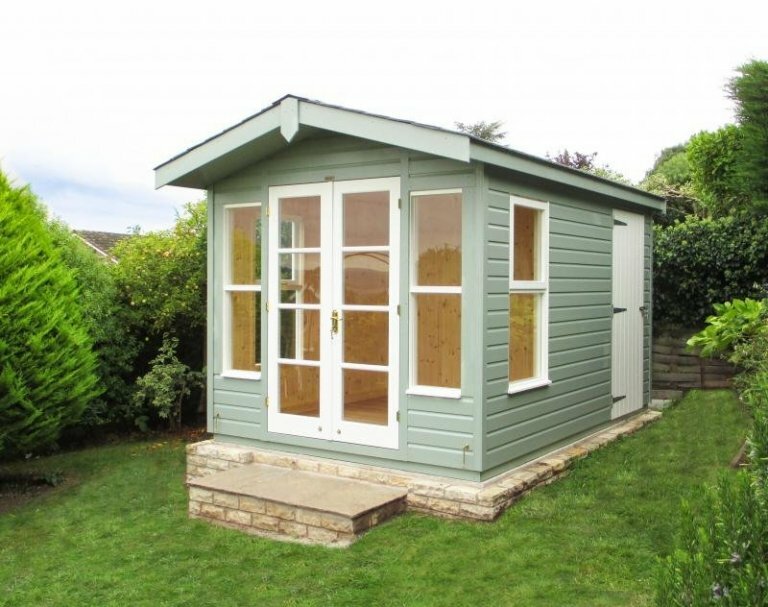 This 2.4 x 3.6m Blakeney Summerhouse has been installed, overlooking our customer’s garden, in Gayton, Merseyside to use as a relaxation focal point of their garden, with a helpful storage section to the rear of the building to put away garden furniture at the end of the day. The storage section measures 2.4 x 1.2m: it has a single shed style door on the right-hand side, and is unlined. 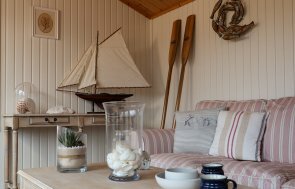 The summerhouse area is 2.4 x 2.4m, with a roof overhang, double doors, natural matchboard lining on the internal walls, and insulation in the walls and ceiling. Grey slate composite tiles have been used on the roof for a highly durable, attractive finish, and the pitch of the roof has actually been lowered to keep the building below 2.5m, meaning the customer didn’t have to apply for Planning Permission. The customer also chose to have a heavy duty floor (ex 38mm thick) instead of the standard ex 19mm thick floor. 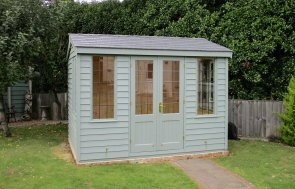 To finish off the outside of the summerhouse, the customer opted for two paint colours from our Valtti paint range: Sage for the main body of the building, and Ivory for the doors and windows. Polished brass doors and window furniture was also chosen, which goes very nicely with the warmth of the natural matchboarding inside. 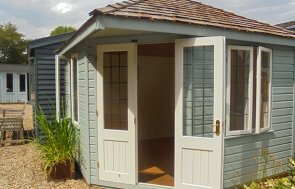 If you like the look of this Blakeney, or you would like to look at some other options, please look at our ranges of Summerhouses, Garden Studios and Garden Rooms to get a good feel for our high quality timber buildings. For more information, please call us on 01760 444229 or come and visit our Nottingham Show Centre to see our buildings for yourself and speak to our helpful team.